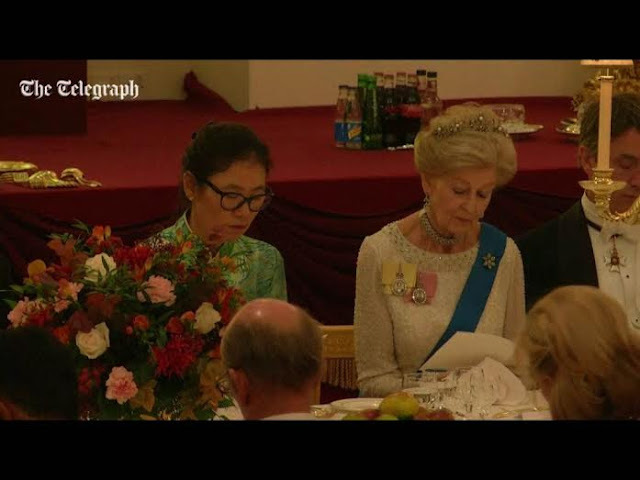 The event many have been waiting for finally arrived this evening: the Duke and Duchess of Cambridge attended a state banquet at Buckingham Palace. Let's look at the royal jewels on show, shall we? I also spot a large brooch or pin attached to the back of the Queen's order sash, but unfortunately, I haven't found any photographs that show the piece clearly. 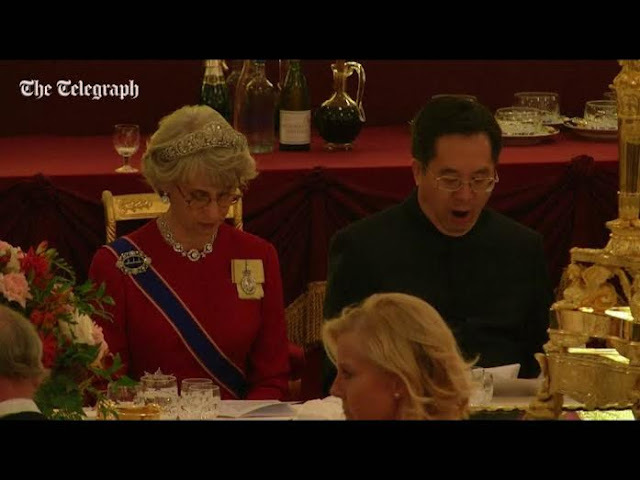 The Prince of Wales and the Duchess of Cornwall didn't attend the banquet, so the next most senior royal lady at the banquet was Kate. Her prime position beside the President of China meant that we got a good look at her jewels. She repeated the same tiara she wore at a diplomatic reception in 2013: the Lotus Flower (or Papyrus) Tiara that belonged to the Queen Mother. You can read more about its history over here. Kate also wore a pair of diamond earrings that she debuted during the Cambridges' post-wedding visit to Los Angeles in 2011. At the time, a television reporter stated that the earrings had been loaned to Kate by the Queen. The palace never confirmed or denied that report. Perhaps most exciting, however, was the pair of bracelets worn by Kate at the banquet. Both diamond bracelets were loans from the Queen. The first, a small bracelet with a meander pattern, was originally a choker necklace from Queen Mary's collection. It was later converted to a bracelet by the Queen Mother. The bigger of the two loans, however, was something of a stunner: the diamond bracelet that Prince Philip helped design in 1947 as his wedding gift to the Queen. The bracelet was made from diamonds that were sourced from a tiara that had belonged to his mother, Princess Andrew (born Princess Alice of Battenberg). That tiara, which was set with diamonds and aquamarines, had been part of a parure given to Alice as a wedding present by her uncle and aunt, Tsar Nicholas II and Tsarina Alexandra of Russia. To my knowledge, no one but the Queen has ever worn the bracelet in public until yesterday. Diamonds from Alice's Russian tiara were also used to make the Queen's engagement ring. Here's a photograph of the Queen wearing the bracelet shortly after her accession. You can read more about its history here. Princess Anne did attend the banquet, as we predicted here last week; she wore her lovely diamond festoon tiara. The Duchess of Gloucester wore lots of diamonds, including the all-diamond setting of Queen Mary's Honeysuckle Tiara. She also wore a necklace and earrings that belonged to her mother-in-law, Princess Alice, Duchess of Gloucester. 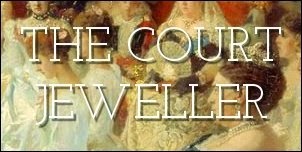 The brooch she has pinned to the sash of the Royal Victorian Order is a part of a jeweled belt buckle worn by Queen Mary; it was recently discussed at the Royal Jewels of the World Message Board here. She's also wearing Queen Elizabeth II's family order, which is attached to a yellow ribbon. Princess Alexandra wore the pearl setting of the Ogilvy Tiara, plus diamond earrings, her diamond choker, necklace, and a diamond floral brooch pinned to the sash of the Order of the Garter. Also, see the pink family order pinned to her gown? The Queen and Princess Alexandra are the only two living people who have the Royal Family Order of King George VI. Alexandra wears it just below the yellow-ribboned order of her cousin, the Queen.